Wine Advocate Scores Cos d'Estournel 2016 98-100 - "Boom—and Cos drops the mic." Join Spectrum Wine Auctions for an evening of extraordinary wine to accompany extraordinary baseball. We will be pouring thirteen world-class wines carefully selected from several outstanding cellars on offer in our May auction series. The tasting will be held at a private residence overlooking Petco Park in downtown San Diego on the evening of the Dodgers vs Padres MLB game. The address of the residence will be sent once we have confirmed your RSVP. San Diego's finest gourmet street tacos and other light fare will be served to accompany the wines. RSVP now - space is limited. Please join Spectrum Wine Retail, in conjunction with Legend Cellars and David Shiverick of Langdon-Shiverick Imports, for an extensive tasting of rare offerings from the legendary Domaine Jean-Louis Chave of Hermitage. “I rarely report on them because they are, for all intents and purposes, unobtainable.” – Robert M. Parker, Jr.
As the SR 29 highway begins to wend more northwesterly at Bale Lane and crosses Ritchey Creek, one crosses the AVA border into the famed Calistoga Viticultural Area at Napa’s most northerly corner. Resting atop the highest concentration of volcanic soils of any of Napa’s subregions and boasting both the highest diurnal temperature variation and the greatest steeply-sloped-hillside-to-valley-floor vineyard ratio in the valley, Calistoga is able to yield some of Napa’s most distinctive wines. And one of Calistoga’s – and Napa’s – greatest jewels is the legendary 35-acre Eisele Vineyard in the northeastern foothills. Just as the hopeful harvest of a complicated vintage began to take shape in September 2008, news began to trickle in to Pouilly that the plane carrying one of France’s greatest winemakers had gone down in the Dordogne. Even though this man – the Loire Valley’s great dissident conscience, Didier Dagueneau – had only been releasing his own wines since 1982, he had in short order made an indelible mark on the history of the Loire Valley and on the genre of white winemaking generally. Thus not only was the tightly-knit wine community of the Centre-Loire shaken by his loss, but the world’s greater wine community was as well. Irvine, California-based Spectrum Wine Auctions LLC, one of the world's leading fine and rare wine auction houses, is pleased to announce that it will be selling The Hudson Highlands Collection this Spring in both a live auction in Los Angeles as well as in specialized Internet auctions conducted through its feature-rich website and state-of-the-art online bidding platform. The Spring 2015 Live Auction Featuring The Hudson Highlands Collection will take place on Saturday 14 March 2015 at SoHo House West Hollywood, and it will be preceded by The February 2015 Distinguished Cellar Series Internet Auction that will run from Friday 6 February through Thursday 12 February. Boston, Massachusetts – December 3, 2014 – eProvenance, a Franco-American company providing advanced technology to monitor fine wines as they travel from wine producer to customer, has teamed up with Spectrum Wine Auctions to assure the provenance of 31 cases of top Bordeaux wine. This collection includes pristine OWCs from top producers including Ch. Pavie, Ch. Palmer, Ch. Angélus, Ch. Ducru-Beaucaillou, Ch. Pichon-Lalande, Ch. Gruaud-Larose and more from the historic 2009 vintage, which are available through the Spectrum Winter 2014 Auction. The catalog is available online now at www.spectrumwine.com and the live auction will be held on December 13, 2014 at Soho House in West Hollywood, California. 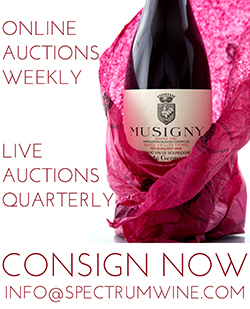 (November 24, 2014; IRVINE, CA)—Today California-based Spectrum Wine Auctions announced the highlights of The Winter 2014 Live Auction, set to take place on Saturday, December 13, 2014 at the ultra posh Soho House in West Hollywood. Join Spectrum Wine Auctions for a pre-auction tasting with our friends at Irvine's Wine Cellar Club. The Summer 2014 Auctions Are Now Online! From cover to cover, the Summer 2014 Auction is packed with the greats. Domaine de la Romanée-Conti, Château Pétrus, Le Pin, First Growth Bordeaux, Sine Qua Non, Screaming Eagle, Leroy, Méo-Camuzet, de Vogüé, Armand Rousseau, G. Conterno, Penfolds Grange – if you are looking for it, we probably have it on offer here! The live auction will take place June 14th starting at 11AM. Pre-bidding is now open and will stay open until the live auction starts. Record Setting Winter 2012 Auction for Spectrum Wine Auctions in Hong Kong (January 10, 2013; Irvine, CA) – Spectrum Wine Auctions LLC, the leading California-based wine auction house, concluded 2012 with one of its most successful auctions to date. The Winter 2012 Auction, held on December 15, 2012, at the Grand Hyatt Hotel in Hong Kong, featured an extremely active standing-room-only saleroom leading to spirited bidding on 966 lots, with fierce competition on direct consignments from The Heart Collection, Château La Lagune, Château Meyney, and record prices for premium wines including 2005 Domaine de la Romanée Conti La Tâche. The conclusion of The Winter Auction rounds out Spectrum Wine’s year totaling more than $14.5 million in sales. (IRVINE, Calif.) - Irvine, California-based Spectrum Wine Auctions LLC, one of the world's leading fine wine auction houses, is pleased to announce that it will be selling The Heart Collection this winter in a live auction in Hong Kong, as well as special Internet auctions through its feature-rich website and state-of-the-art bidding platform. The Winter 2012 Live Auction Featuring The Heart Collection will take place on Saturday, December 15, at The Grand Hyatt in Hong Kong, preceded by The Heart Collection Internet Auction that will run from November 2 through November 20. The Heart Collection, which is valued at over $1.6 million and contains many of the world's finest wines was consigned by a well respected Beverly Hills family who will donate the proceeds from the sales to The Heart Foundation. RSVP for Pop-Up Tasting - Champagne’s Grandes Marques on Wednesday, July 25! Right Bank Rarities…Ex-Château La Croix de Gay and La Fleur de Gay, In Stock Now! You are Invited to a New Series of FREE Tastings! Announcing the Spectrum Wine Auctions “Pop-Up” Series: First Tasting of Haut-Brion vs. La Mission Haut-Brion June 27, 2012 | Space is Limited - RSVP Today! In the spirit of the “pop-up” restaurant craze, Spectrum Wine Auctions is excited to announce that we will host monthly thematic tastings in Los Angeles, Orange County, and beyond! Click here for details. Enjoy Pristine Wines from “A Doctor’s Carefully Curated Cellar” in the Summer Auction! Bid Now on Amazing DRC Assortment Cases in the Summer Auction! Order Today: Pessac-Léognan, “Bordeaux’s Bastion of Value,” Ready to Drink! Pre-Arrival: Aged and Ready to Drink Wines Ex-Château from Bordeaux - Arrives August 2012! One of the recent great success stories in Bordeaux is that of Hélène Garcin who has been producing any number of superb wines at her estates in St. Émilion (Château Barde-Haut), Pomerol (Clos l'Eglise) and Pessac-Léognan (Château Haut Bergey). Winemaking is a family affair chez Garcin as Hélène's mother; Sylviane Garcin-Cathiard, is related to the Cathiard family of Château Smith Haut-Lafitte. Don't pass up this opportunity to procure some of her high-scoring wines procured directly from Bordeaux. Join Us in June for a Head-to-Head Tasting of Chateau Haut Brion and Chateau La Mission Haut Brion! Please join Jason Boland, President of Spectrum Wine Auctions, and Dan Rhodes, Specialist, for a head-to-head tasting of dueling vintages from illustrious twin Chateaux, Haut Brion and La Mission Haute Brion. Space is limited - RSVP today! 2011 Bordeaux Futures Part II: From Château Margaux to Château D'Armailhac Arrives On or Around May 2015 We are excited to bring you our second offering of 2011 Bordeaux. This week's offering includes the wines of Château Margaux which were some of our favorite wines tasted in Bordeaux, especially Pavillon Blanc which is our pick of the week. Also included in this week's offer is the classic favorite Château Lynch Bages. We think Jean-Charles Cazes did an excellent job combining both quality and value in the 2011 Château Lynch Bages. 2011 Bordeaux Futures: From Château Malescot St-Exupery to Château Lafite Rothschild Arrives Spring 2015 We are excited to bring you our first offering of 2011 Bordeaux. Included are two of Spectrum Wine's favorites from our tastings in Bordeaux: Château Malescot St-Exupery which we think is always a great value, and Château Pontet Canet which produced another fantastic wine this year right after their 100RP point 2009 and the 96-100RP in 2010. For the collector in mind, we have an offering of Château Lafite Rothschild in various packaging options. Lastly to round out the selection we included a few Sauternes including the 2011 Château Climens. In Stock Now: Loire Valley Wines Perfect for Summer starting at $15.99! Ships in Two Days! Even More Pre-Arrival Value 2009 Bordeaux Available - Order Today! We are proud to include another great selection of 2009 Value Bordeaux. All the wines in this selection are 90 points or higher and some can be yours for as little as $17.99 a bottle! Don't skip this week's Spectrum Wine Value Pick as it really delivers quality wine for a below average price. A selection of sleeper 2009 Bordeaux on sale! We are proud to continue our offering of amazing value Bordeaux from the acclaimed 2009 vintage. This selection continues to provide great value for the discerning wine drinker that is looking for impressive wine for every day drinking. Pre-Arrival Offering of Incredible Value 2009 Bordeaux Arrives June 2012 Spectrum Wine Auction's Jason Boland and Mark Levin spent the last week traveling through Bordeaux tasting the much talked about 2011 vintage. While Jason and Mark were hard at work evaluating the 2011 vintage for Spectrum Wine's clients they also were able to bring back a number of offerings of wines from the acclaimed 2009 vintage. The first offering includes a wonderful selection of 93+ wines direct from Bordeaux at great prices. (March 29, 2012; Hong Kong) – The Spring 2012 Auction, held by Spectrum Wine Auctions LLC of Irvine, Calif., continued to put the strength of the Hong Kong market on display by realizing an impressive sale total of US$4,495,664 (HK$34,841,396) and 1539 lots sold on March 23 and 24, 2012 at the Grand Hyatt Hotel, Hong Kong. (March 7, 2012; IRVINE, CA)—California-based Spectrum Wine Auctions announced today highlights from its first Hong Kong sale of the year, to take place on March 23 and 24, 2012 at the Grand Hyatt Hotel, Hong Kong. Please join Spectrum Wine Auctions for a truly memorable wine dinner with Chateau d'Yquem. We will be pairing and pouring an incredible selection from the Chateau along with an exquisite four course menu presented by world renowned chef Wolfgang Puck. Please join Spectrum Wine Auctions for a remarkable evening featuring wine from Chateau Palmer paired with an exquisite seasonal menu specially prepared by Chef Rory Hermann. (February 9, 2012, London) Last night saw the eagerly anticipated inaugural fine wine auction, ‘The Evening Sale,’ brought to London by Spectrum Wine Auctions LLC and Vanquish Wine Ltd at the Mandarin Oriental. Boasting an exhilarating atmosphere, standing-room only, and an impressive international roster of bidders, the auction achieved the exciting task of redefining the fine wine auction concept in London, teamed with a coveted mix of some of the rarest and finest wines, Champagnes and spirits to reach the London auction market. Spectrum Wine Auctions, a California-based auction house whose live sales have realized nearly US$37 million since launching in November 2009, is set to celebrate its second anniversary with a live auction in Hong Kong on December 3 and 4, 2011, featuring offerings from nine highlighted collections of remarkable provenance and spectacular condition. Highlights include more than 600 lots of top-shelf Burgundy, with a magnum of 1999 Henri Jayer Cros Parantoux, cases of Domaine Meo-Camuzet, a veritable plethora from Leroy, as well as nearly 175 lots of Domaine de la Romanée-Conti. The late Mr. Burnam began collecting wine back in the 1960s. At the time he sought advice from Nathan Chroman, then the wine writer for the Los Angeles Times, as well as John Brincko, a well-known wine connoisseur and collector. Armed with priceless knowledge and insights, Mr. Burnam became a very selective buyer, collecting the best Bordeaux, DRC and other great Burgundies in case quantities, all from reputable retailers. Your December Catalog is Online - See Amazing Highlights! Spectrum Wine’s Autumn 2011 Auction In Hong Kong Will Feature “The Majestic Cellar" and Much More! (September 8, 2011; IRVINE, CA)—Spectrum Wine Auctions is set to capture international attention amongst wine collectors on September 24 and 25, 2011 at the Grand Hyatt Hotel, Hong Kong, when it offers a once-in-a-lifetime single-owner collection. “The Majestic Cellar: Property of a Passionate New York Connoisseur” comes from a highly respected New York consignor who has spared no expense to obtain wines boasting perfect provenance. Over 700 lots with a pre-sale estimate of over US$2 million (HK$17.1 million) will be the heart of an incredible two-day sale. The entire event features a total of 1,606 lots of rare and collectible wines, and carries a pre-sale estimate of nearly US$6 million (HK$46.8 million). Richard Brierley, head of fine wine at Vanquish Ltd., will preside as auctioneer. Bidding begins at 11 a.m. on both days. (July 6, 2011; IRVINE, CA)—Spectrum Wine Auctions dazzled bidders in Hong Kong on June 25 and 26 at its largest sale to date since launching in July 2009. Guests entered the newly built 118-story gem of Hong Kong, the International Commerce Center (ICC), passing by Rolls-Royces and Ferraris parked at the entrance, arriving to an auction room filled to capacity. The Spectrum team matched the splendor of the space by offering the packed room of bidders tastes of rare wines such as 1989 Château Haut Brion, 1995 Château Latour, 2004 Château Ausone, 1986 and 1990 Château Mouton Rothschild, and 2007 Domaine de la Romanée Conti La Tâche. (June 2, 2011; IRVINE, CA)—On the heels of the blockbuster $5.5M auction in March, Spectrum Wine Auctions, one of the world’s leading international fine and rare wine auction houses, will offer three major single-owner collections in the upcoming live auction, to be held at the brand new Ritz-Carlton Hong Kong, now the world’s tallest hotel, on June 25 and 26. Richard Brierley, current Head of Fine Wine at Vanquish Ltd., and previous Head of North American Wine Sales at Christie’s, will preside as auctioneer as he did for the March sale. To supplement the live sale, Spectrum Wine will offer additional wines from these three hallmark consignments in its largest ever internet-only auction on June 30. 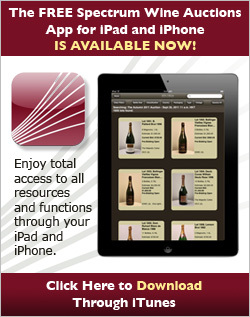 For more information or to request a printed catalog for either the live or online sale, go to www.spectrumwine.com or call 949.748.4845. (March 16, 2011; IRVINE, CA)—Spectrum Wine Auctions, one of the new leading players in fine and rare wine auctions, sold an impressive 97.4% of the 1,752 lots offered at its massive two-day Spring 2011 Live Auction, held on March 12 and 13 at The Sheraton Hong Kong Hotel & Towers. This was Spectrum Wine’s sixth live sale since launching in July 2009, and their largest sale to date, realizing $5,525,121 ($43,044,938 HKD). (March 11, 2011; IRVINE, CA)—Spectrum Wine Auctions, one of the new leading players in fine and rare wine auctions, announced today the hiring of Amanda Crawford as auction director and lead specialist. Crawford, who previously served in the wine department as assistant vice president and lead specialist at Christie’s, brings extensive experience in securing domestic and international consignments, assessment of rare bottles, and working with a broad range of multinational clients. Her hiring is part of a sequence of recent high profile appointments which includes the hiring of renowned wine authority Kevin A. Swersey as senior consultant and strategic advisor this January. (February 22, 2011; IRVINE, CA)—Spectrum Wine Auctions, one of the new leading players in fine and rare wine auctions, will hold its largest live auction to date on March 12 and March 13, 2011 at 10:00 a.m. HKT (March 11 and March 12, 2011, 6:00 p.m. PST) at The Sheraton Hong Kong Hotel & Towers, located at 20 Nathan Road, Kowloon, Hong Kong. The massive two-day Spring 2011 Live Auction will feature more than 1,700 lots of some of the world’s most sought after collectible wines, including the second installment of The Doctor’s Pristine OWC Collection and consignments purchased directly from the cellars of Château Mouton Rothschild, Château d’Yquem and Compañia Vinícola del Norte de España. The sale will offer a staggering 1,200 lots of Bordeaux including a 34-year vertical of Château Mouton Rothschild, cases of 1982 Château Lafite Rothschild and rare Château Latour vintages from the 1930s. Close to 14,000 bottles will be offered with a pre-sale estimate of nearly $5 million. Richard Brierley, current Head of Fine Wine at Vanquish Ltd., and previous Head of North American Wine Sales at Christie’s, will preside as auctioneer. Amanda Keston details how to become a wine connoisseur and bid on wine bottles worth anywhere from $15.00 all the way to $25,000.00. Join the Spectrum Wine Auction site as a member and you can bid right away. (January 4, 2011; IRVINE, CA)—Spectrum Group International (SPGZ.PK) announced today that it has tapped renowned wine authority Kevin A. Swersey as senior consultant and strategic advisor for its subsidiary Spectrum Wine Auctions. The alignment with Mr. Swersey is an important part of the expansion of Spectrum Wine Auctions, which conducted its first live sale in November 2009 and has since sold $17.7 million with its live auctions in California and Hong Kong. (December 10, 2010; IRVINE, CA) Spectrum Wine Auctions, which launched in December 2009, has deftly positioned itself as one of the world’s leading wine auction houses. On Sunday, the firm completed its first year of sales with the 2010 Winter Rare Wine Auction at The Sheraton Hong Kong Hotel & Towers. Bidding was extremely competitive in the packed auction room, and the sale realized $4,439,080 against a pre-sale estimate of $3.5 million. The sale featured half of an important private U.S. collection called “The Doctor’s Pristine OWC Collection,” and was Spectrum Wine’s largest to date. The second half of the collection will be sold by Spectrum Wine in March 2011. Since launching last December, the auction house’s five sales have brought in over $17.7 million. (December 14, 2010; IRVINE, CA) Spectrum Wine Auctions, one of the world’s leading auction houses of fine and collectible wine, today announced the hiring of Walker Strangis as director of consignments. Strangis brings to Spectrum Wine a strong background in working with Asia-based clients, having previously worked with Zachys Wine Auctions as property specialist, where he oversaw the company’s outreach in Asia. At Zachys, he was instrumental in processing the movement of massive volumes of wine to Hong Kong as well as fostering relationships with Asian buyers. His appointment comes as Spectrum Wine Auctions celebrates the first anniversary of live auctions which have brought in over $17.7 million. Let us help you ring out 2010 and ring in 2011 with a spectacular array of wines from around the world. Our December Internet Auction Part II will be a two day event (December 29-30) with a stellar selection of stars from France, California, Italy and other prestigious locales. Open for more details! (November 9, 2010; Irvine, CA)—Southern California-based Spectrum Wine Auctions, the world’s newest high-end auction house of fine collectible wine, will hold its 2010 Winter Rare Wine Auction on Sunday, December 5, 2010 at 10:00 a.m. HKT (December 4, 2010 at 6:00 p.m. PST) at The Sheraton Hong Kong Hotel & Towers, located at 20 Nathan Road, Kowloon, Hong Kong. The auction consists of 1,181 lots and has a pre-sale estimate of $3.6 million. (November 8, 2010; Irvine, CA)—Spectrum Wine Auctions, California’s leading auction house of fine and rare wine and an industry leader in the implementation of cutting-edge technology, will hold its next internet-only auction on Nov. 11 at 10:00 a.m. PST. Spectrum Wine’s online sales are consignment-based and offer consumers around the world access to cellared wines of various price points, vintages and regions rarely found in traditional retail outlets. These online auctions offer many single bottle lots, a great opportunity for those wishing to buy collectible wines to consume without having to invest in a full 12-bottle case. The bi-monthly auctions are held in addition to Spectrum Wine’s quarterly live auctions in California and Hong Kong and are accessible at www.spectrumwine.com. (September 29, 2010; IRVINE, CA)—Spectrum Wine Auctions, California’s leading auction house of fine and rare wine, brought in $3,388,490 at its fourth live auction on Friday, September 24 at the Peninsula Hotel in Beverly Hills, Calif., and Saturday, September 25 at the Peninsula Hotel in Hong Kong. The Autumn 2010 Auction exceeded the pre-sale estimate of $3.2 million and 99.8% of the 755 lots on offer were sold by lot. (August 30, 2010; IRVINE, CA) Spectrum Wine Auctions, Southern California’s leading auction house of fine and rare wine, will hold its first sale of the fall 2010 auction season on Friday, September 24 at 6 p.m. PDT at the Peninsula Hotel in Beverly Hills, Calif., and Saturday, September 25 at 9:00 a.m. HKT at the Peninsula Hotel in Hong Kong. Highlights include some of the greatest vintages from benchmark producers in Bordeaux, Burgundy and California. The total pre-sale estimate for the 761 lots on offer is $3.2 million. Spectrum will also launch its “Autumn 2010 Internet Auction” on September 24 for those buyers looking for single bottles and wines not offered in the live auction. July 15, 2010; Irvine,CA - Spectrum Wine Auctions, the world’s newest auction house of fine and collectible wine, today announced the appointment of Powell Yang as director of consignments. Yang, who is fluent in Mandarin Chinese, joins Spectrum Wine’s young and dynamic team with the goal of expanding the auction house’s reach into the Asian market, while utilizing his existing relationships to further cultivate Spectrum Wine Auctions’ customer base in the United States. July 1, 2010; Irvine, CA - Spectrum Wine Auctions, the world’s newest high-end auction house of fine collectible wine, brought in a total of $3,020,866 in its third live wine auction, held simultaneously on Friday, June 25 at Charlie Palmer at Bloomingdale’s South Coast Plaza in Costa Mesa, Calif., and Saturday, June 26 at the Peninsula Hotel in Hong Kong. A rare bottle of ex-cellar 1973 Chateau Montelena Chardonnay is being sold to raise funds for Haitian charity Friends of the Orphans. Spectrum Wine Auctions, which debuted to the international wine market last fall as a new major player, will hold its next fine and rare wine live auction simultaneously on Friday, June 25 at Charlie Palmer at Bloomingdale’s South Coast Plaza in Costa Mesa, Calif., at 6 p.m. PDT, and on Saturday, June 26 at the Peninsula Hotel in Kowloon, Hong Kong, at 9 a.m. HKT. In volatile financial times like these, some investors are looking for ways to diversify their portfolio far beyond just the usual stocks and bonds - and the options are vast and virtually endless. Alternative investments like rare coins, collectible stamps, vintage antiques, even fine wine, are just a few of the examples that might just bring the boost you need. Irvine, CA, April 27, 2010 – With a champagne toast and a pound of the hammer, Principal Auctioneer and Spectrum Wine Auctions’ Director of Client Services Amanda Keston kicked off Spectrum Wine Auctions’ second live auction last weekend, held simultaneously at Charlie Palmer Bloomingdale’s South Coast Plaza in Costa Mesa, California and Crown Wine Cellars in Hong Kong. Before the auction was over, a world record was set, and an astonishing 858 lots and $3,475,260 million ($HKD 26,978,709) in fine and collectible wines had changed hands with nearly 100% of lots sold. Irvine, CA, March 18, 2010 – After a stunning success in 2009 for their very first live auction and multiple online auctions each month since last July, new auction house Spectrum Wine Auctions has confirmed dates and locations for their first live auction of 2010, another global event. The auction takes place simultaneously on Saturday, April 24 at Charlie Palmer at Bloomingdale’s South Coast Plaza in Costa Mesa, California, and on Sunday, April 25 at Crown Wine Cellars in Hong Kong. The auction will present more than 850 lots, which includes collections of two anchor consignors: The Aubrey McClendon Collection Part II and The Historic Collection of Dr. George Primbs. Irvine, CA, March 8, 2010 – After a stunning success for their very first live auction in November 2009, new auction house Spectrum Wine Auctions has announced the latest in its series of online wine auctions. The next online auction, the March 2010 Online Auction Part 1, has pre-bidding underway from now until Thursday, March 11, 2010, when live Internet bidding on 204 lots begins at 10:00AM Pacific Standard Time. Chesapeake Energy CEO Aubrey McClendon may have sold off wine at an auction earlier this year but he still has cases and cases to go. The Wealth Report draws our attention to the "The Aubrey McClendon Collection" sale scheduled for November 21 at The St. Regis Monarch Beach Resort in Dana Point, California. Spectrum Wine Auctions will be simulcasting the sale in Hong Kong, which appears to be where the big spenders on vintage wine are these days. The sale will feature more than 3,000 bottles and may bring in as much as $3 million.